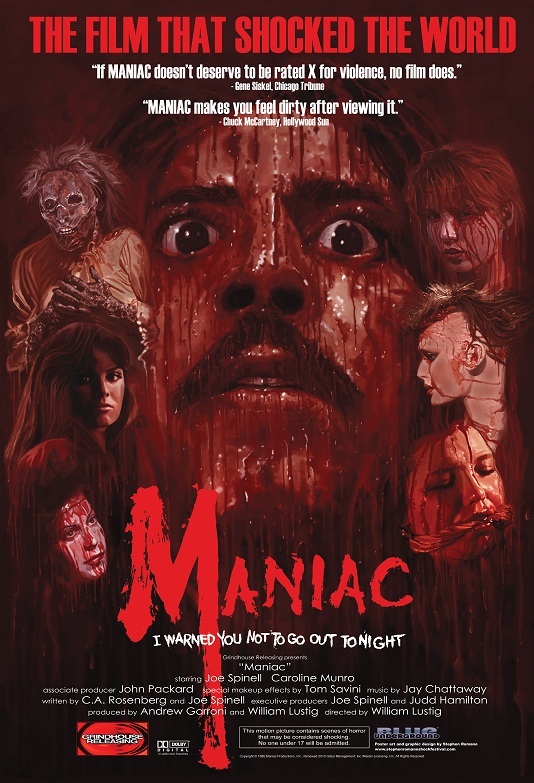 Schlock-Wire: Grindhouse Releasing Bringing MANIAC Back To The Big Screen This Fall – Schlockmania! HOLLYWOOD, Calif. – Grindhouse Releasing, the company that brought you THE EVIL DEAD, CANNIBAL HOLOCAUST, PIECES and Duke Mitchell’s GONE WITH THE POPE, has partnered with director Bill Lustig of Blue Underground to present Mr. Lustig’s controversial horror classic MANIAC in theaters across North America. 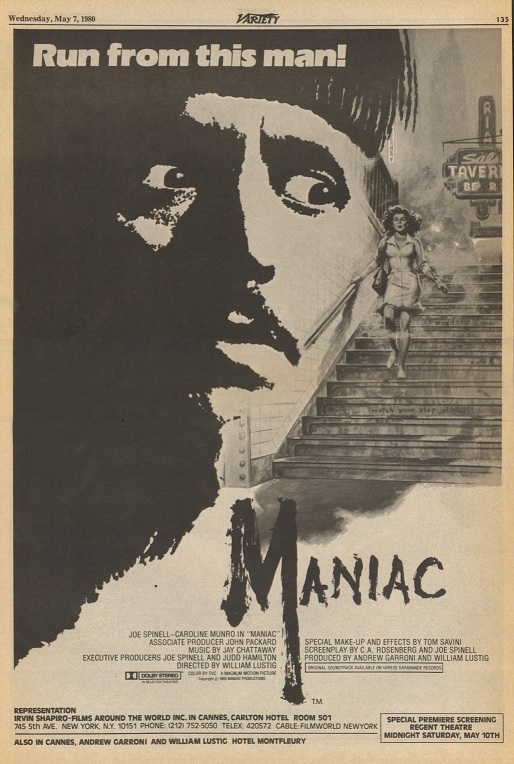 MANIAC stars Joe Spinell (ROCKY, THE GODFATHER, TAXI DRIVER) as Frank Zito, a deeply disturbed man haunted by the traumas of unspeakable childhood abuse. When these horrific memories begin to scream inside his mind, Frank prowls the seedy streets of New York City to stalk and slaughter innocent young women. Even as he begins a relationship with a beautiful photographer (Caroline Munro of THE SPY WHO LOVED ME), Frank continues to act on his vile compulsions. The film holds nothing back in depicting the atrocities of a human monster. 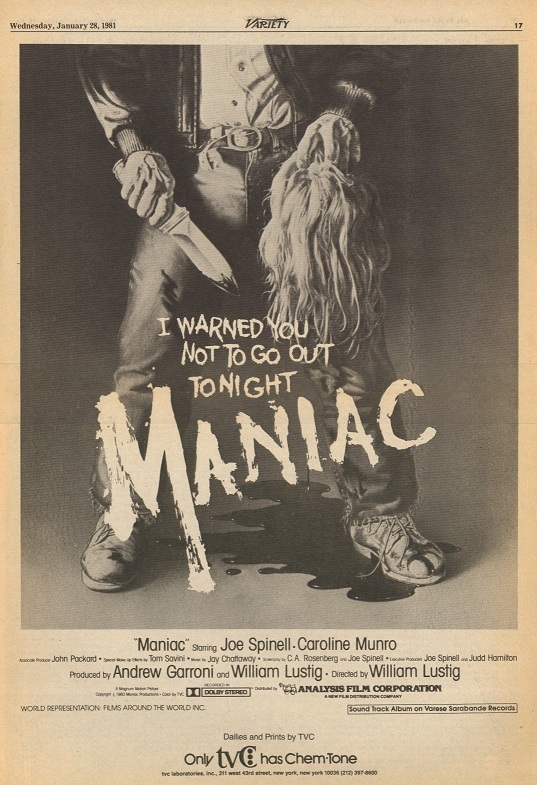 Aside from the shocking, bloody special effects sequences, MANIAC draws much of its power from the acting of the late Spinell, who also co-wrote and executive produced the film. Grindhouse Releasi ng specializes in restoring and distributing the most extreme and controversial horror and exploitation films of our time. The company was founded in 1996 by actor/director Sage Stallone (VIC, ROCKY V) and Bob Murawski, the Oscar-winning film editor of THE HURT LOCKER, Sam Raimi’s SPIDER-MAN 1, 2 & 3 and DRAG ME TO HELL. Author David Szulkin (WES CRAVEN’S LAST HOUSE ON THE LEFT) runs the company’s theatrical division, which has had its most successful year to date thanks to the phenomenal success of EVIL DEAD and the first-run release of GONE WITH THE POPE in more than 25 U.S. cities. For more information, visit www.GrindhouseReleasing.com or dial 323-963-GUTS (323-963-4887). 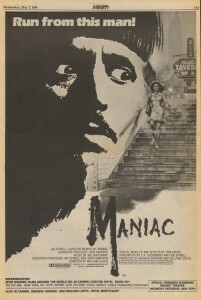 To book MANIAC at your theater, and to receive press materials, e-mail David Szulkin at info@grindhousereleasing.com. Coming in 2011 to Loft Cinema (Tucson), Music Box (Chicago), Hollywood Theater (Portland, OR), and more! MORE BIG-SCREEN MADNESS FROM GRINDHOUSE RELEASING! See the following films in theaters, the way they were meant to be experienced! October 8 New Beverly (Los Angeles) *3rd encore screening! October 30 – ZomBCon, Seattle, WA, with Bruce Campbell and the Ladies of the Evil Dead in person! Schlock-Wire: Report From the GONE WITH THE POPE Premiere!